Doxygen doesn't incorporate all member files but just a definable subset (basically the main project source code files that are written in a supported language). So to search and browse all member files you may visit the Fossies arangodb-3.4.5.tar.gz contents page and use the Fossies standard member browsing features (also with source code highlighting and additionally with optional code folding). 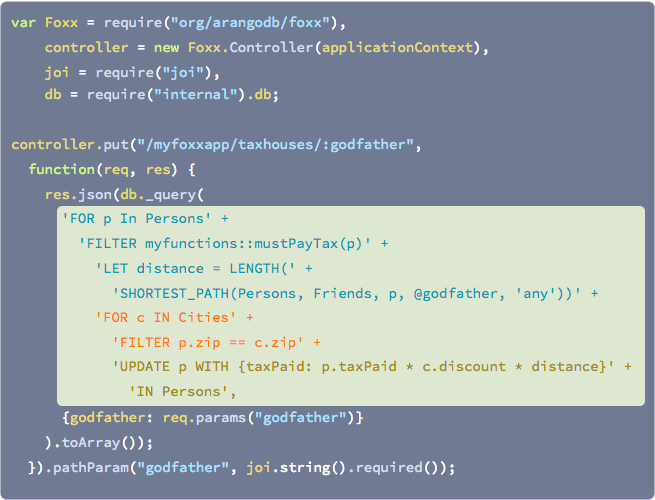 The supported data models can be mixed in queries and allow ArangoDB to be the aggregation point for your data. To get started, try one of our 10 minutes tutorials in your favorite programming language or try one of our ArangoDB Cookbook recipes. For the impatient: download and install ArangoDB. Start the server arangod and point your browser to http://127.0.0.1:8529/. Multi-Model: Documents, graphs and key-value pairs model your data as you see fit for your application. Joins and transactions are key features for flexible, secure data designs, widely used in relational databases but lacking in many NoSQL products. However, there is no need to forgo them in ArangoDB. You decide how and when to use joins and strong consistency guarantees, without sacrificing performance and scalability. Next step, bundle your Foxx application as a docker container and get it running in the cloud. Packages for all supported platforms can be downloaded from https://www.arangodb.com/download. Please also check what's new in ArangoDB. Please check the Installation Manual for installation and compilation instructions. The User Manual has an introductory chapter showing the basic operations of ArangoDB. StackOverflow is great for questions about AQL, usage scenarios etc.